Trick or Treat? Brussels and Beets! When I originally decided to start blogging, I never intended to add recipes to my collection of topics. But last night I made a meatless chili for dinner in the slow-cooker (off the top of my head) that had my husband going back for third and fourth bowls. My cooking is much like my sewing – I do what I feel like doing in that moment and get a slightly different result every single time I make something. I like it that way. It’s always an experiment in my kitchen, and you never know exactly what you’re going to get. So my husband and I moved in together in 1999, and I’ve been cooking for him daily ever since. There’s been a few occasions over the last 15, almost 16 years that he just plain didn’t like what I made; but, come on now, you can’t please everybody all the time! Anyway, over dinner, he convinced me that I should be adding everything to the blog, including, and most importantly, recipes; because I am an experienced, non-trained professional of the culinary arts and cooking is something I do at least three times a day! I’m half-kidding here. It is what he said, but he was probably halfway making fun of me. Matt and the kids like my food, so that’s good enough for me. But you might like this, too; so I think I’ll share. I have kids w/ food allergies and chemical sensitivities, and I also have my own collection of allergies. With that stack of cards, I can honestly say that I don’t think I’ve actually used a recipe to cook a meal in years! It’s just not possible! The best I can do is look up a recipe and then come up w/ substitutes to fit our egg, dairy, peanut, soy, and gluten allergies. That can get intense! So I am happy to present for you today a side dish that I came up w/ as a result of an allergy test I had done on myself some months ago that revealed many, many food allergies that I didn’t know I had. The test was actually very informative, as it had a list of foods that I should be eating and those I should avoid. 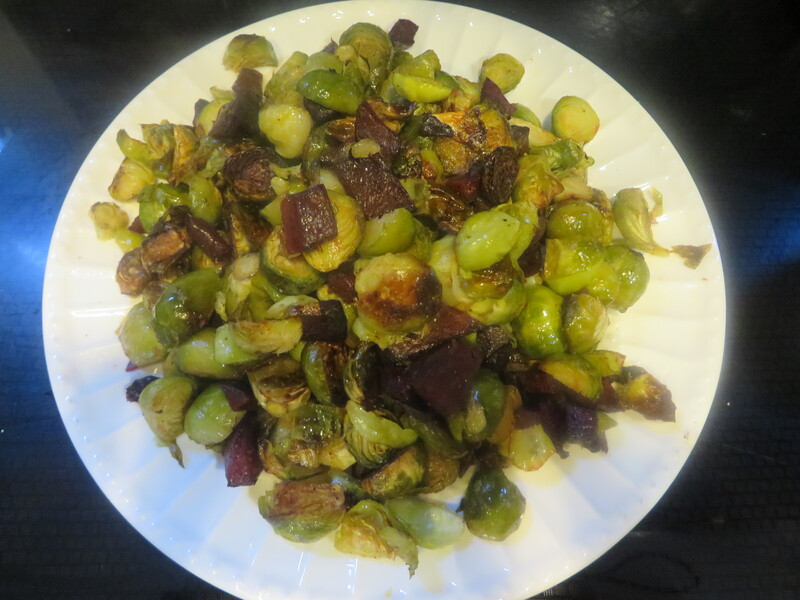 One of the foods that was suggested for me to eat was brussels sprouts; another was beets. I had never tried either of them before and thought it was a curse… until I made up this recipe combining the two! I will definitely be adding brussels to my garden next year! Wash and rinse your brussels and cut them in half or in quarters (the smaller you cut, the crunchier the end result). Pour your sprouts in a large mixing bowl and add your oil, salt, and pepper. Spread your sprouts flat on a baking sheet and pop in the oven for 25 minutes, agitating once if you feel like it (or remember to do it!). 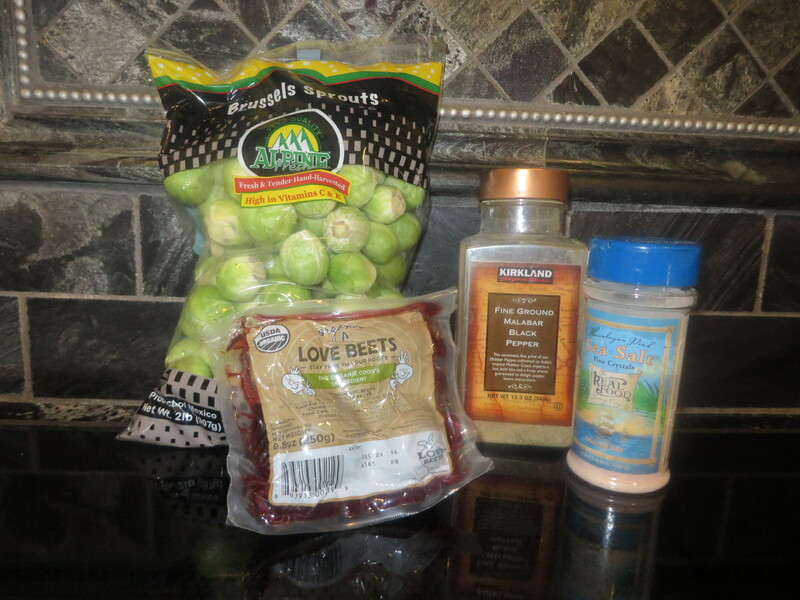 After 25 minutes, add beets to your sprouts mixture and incorporate well. Put them back in the oven for another 20 minutes. Pull out, add more salt and/or pepper, if you’d like, and enjoy! A mountain of sweet and salty eats! This takes me about 20 minutes to prepare and almost an hour to roast, just for reference. I would say it serves six to eight, but my greedy kids and I just pour it on a plate and all go at it. Sometimes we have leftovers; other times we don’t! When my two-year-old decides he doesn’t want to eat these veggies, I take the plate back in the kitchen, put the food on a different plate, add ketchup, and bring it back out presenting it to him as ”chopped up papas fritas,” which is french fries in Spanish. Works 99% of the time! Let me know how you like it if you try it! I also have made this w/ whatever add-ins I had on hand. Sweet corn is good; pine nuts are good. Always looking for suggestions to change things up, so don’t be shy!